Growth. It all begins with a seed. My wife has already begun the preparations for our vegetable garden, and yet the entire backyard is still covered in a foot of snow. She has this little ‘greenhouse’ type thing and all that I can see in it is a ‘green-box’ tray full of dirt. Clearly nothing was going on … or so I thought. A few days later I began to see little green sprouts penetrating the surface of each little dirt square. Yesterday, my daughter noticed that the fast growing plants were all leaning towards the sunlight coming through window, and that the plants closest to the window were larger than the ones further back. Wisely, my daughter took the big tray, and rotated it so that the small sized plants would now be closer to the window, giving them a chance to catch up to their larger species. It will take a few more months for these little ‘baby plants’ to be ready for the big transplant into the outdoor garden. Spiritual growth. Begins with a seed. That seed is ‘The Light’ that shines in and through darkness. When we recognize the voice of the Holy Spirit drawing us into belief, then our minds are flooded with light and we can believe that He is in fact in us. A child level growth sees the basics and may not understand all the ‘depth’ of what has happened inside of them. The young adult may not understand the years of nurture that has and still needs to take place. The adult had a much deeper and peaceful understanding of the source of all light, the one who has been from the beginning. In 1 John 2, the author writes “I speak to you who are mature, because you know Him who has been from the beginning.” This is the mark of one who is mature in Christ. This person ‘knows’ Christ, knows His character, understands that they are in union with Christ and they know His voice. This stage is where the security of the journey is place in the person of Christ. There is no more search for an ‘identity’, as their full identity is wrapped up in Christ. This person also knows the character and heart of the Father, which unbelievably is the same at that of Christ and the Holy Spirit. They are one. This person understands the love dance of the Trinity and recognizes their inclusion inside that relationship. Not only do they recognize their own inclusion, but the entire world’s inclusion into the love of the Trinity. This is a profound truth that if taught bluntly as a child, would not and could not be understood apart from the journey of growing up. A mature adult doesn’t get all bent out of shape by watching ‘children’ play, run, fall, make messes, disrupt, interrupt, spill drinks or any other behaviour that is common to children. After all, they are children and are acting completely according to their stage of life. They don’t use big words or delicate illustrations when teaching children, but rather, simple, less complicated drawings and words. Words they know the children will understand. A mature adult will not get all bent out of shape by watching ‘young adults/teens’ goofing around, making messes, not cleaning up after themselves, self-absorbed, think they know it all, constantly challenge and question everything, mess up, are clumsy with word and deed. After all, they are young adult/teens acting completely according to their stage of life. They won’t use child level language with them, and they won’t use mature adult illustrations and stories as they mentor. The mature one has been there, done that, bought the t-shirt and understands that this too will pass….at least is it supposed to! 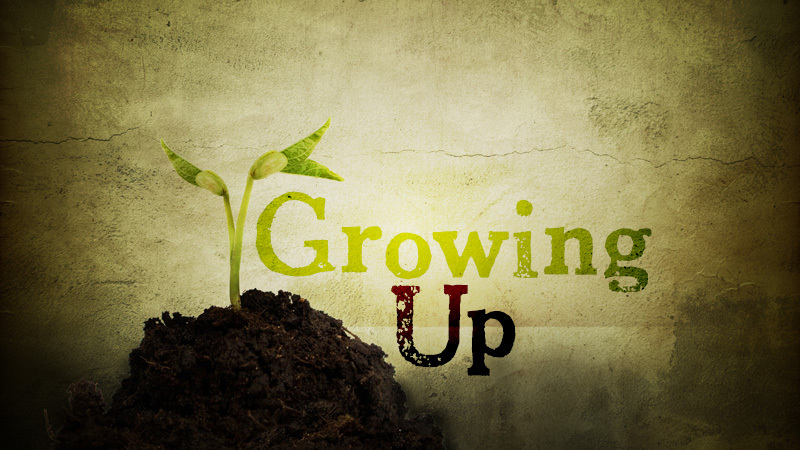 In each stage of growing up, the key ingredient is the “Trinity”, The Father loving us, the Son fellow-shipping and walking with us, and the Holy Spirit indwelling and empowering us. They are the ones in charge of the entire journey from start to finish. The sooner we learn to rest in that truth, the sooner we can begin to enjoy the sights & sounds along our own individual journeys. Have you given any thought to which stage of maturity you are on? Does your heart respond with disgust or with love towards those who ‘behave in an offensive manner’? Could you be trying to ‘walk too fast’ on your journey? Can you see the benefit of slowing down and enjoying the sights & sounds around you? To enjoy HIM inside you? Instead, there must be a spiritual renewal of your thoughts and attitudes. You must display a new nature because you are a new person, created in God’s likeness—righteous, holy, and true. Heavenly Father, in your gentle and loving way, show me how to love others around me. If it has to begin with believing fully that you love me, then let’s stay on that part of the journey as long as you need me to be there. I’m not in a rush. ← Day 16: You NEED friends in order to GROW! “lovingkindness” best brew on tap Mike cannot get enough of the good vintage & pass it around,…enjoy! !